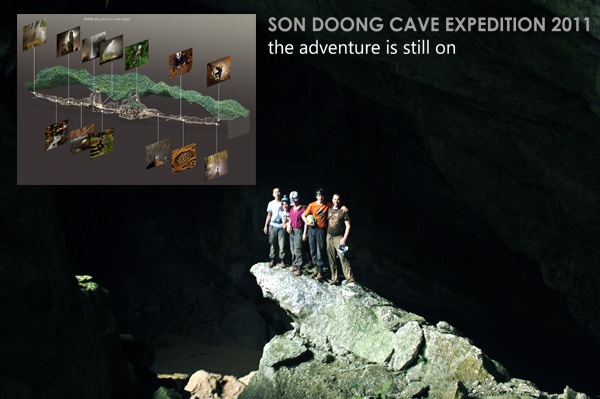 ACTIVETRAVEL ASIA's Blog: The first expedition to Son Doong Cave with ATA – Unrevealed stories! The first expedition to Son Doong Cave with ATA – Unrevealed stories! On 28th Sep, 2011, carrying the eager to explore the grandeur of nature, the first travelers together with ATA’s product manager – Mr. Tony Tran had launched the discovery to Son Doong Cave, the biggest cave in the world. Accompany with the group is Mr. Ho Khanh who found the Son Doong Cave as a tour guide. The first meet with Mr. Ho Khanh really impressed everyone. Just a warm smile, a strong handshake from him is enough to make everyone feel warm at heart. At Ho Khanh ‘s house, the group had the moments of relax with green tea, a simple lunch with steamed rice cake and salted peanut and an open conversation. All of that was promising for a memorable journey. The first obstacle for the group is leaches. They are everywhere and all in hungry for blood. It was really a nightmare at first but as time passes, the scare was fade when everyone got used to them and they weren’t the obstacle anymore. In the deep jungle under shade, the expedition team followed jungle trails that on limestone Mountains to the Swallow Cave. As planned, the expedition team would camp at the Swallow Cave. But “Man proposes, God disposes”, everything weren’t going as planned, it was dark so quickly so the expedition had to camp at a clear ground that is 30 minutes walking to the Swallow Cave. The tents were pitched up, dinner was also cooked and everyone had a good time to eat dinner together. Camping in the deep jungle, it was indeed an interesting experience! Everything was not easier on the next morning. Although the sky seemed so bright, no rain and the ground was dry, the obstacles was still waiting for them. This time was the torrential river bank. If the expedition team couldn’t cross the torrent, that meant they wouldn’t be able to get to Son Doong Cave. This case forced everyone had to discuss and find the way to cross the torrent and after that decided if they could go any further or not. 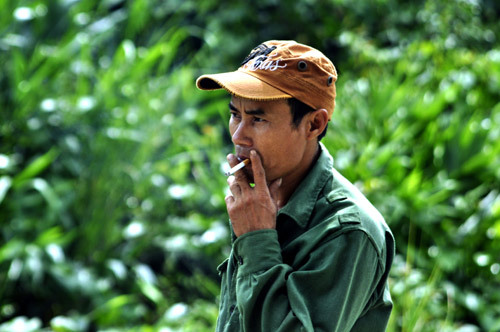 Ho Khanh proved himself as a local guide with many years of experiences. At the hard times, his skill is very essential. He swam to the other side with a rope, he tied it to a tree then he led them crossing the river one by one. After much effort, finally, the group crossed the river safety. With the hope “After a storm comes a calm”, everything would be smooth but the obstacle has passed, another comes. A lake blocks the way to Son Doong Cave. To cross the lake at that time was impossible and instead of risking themselves, it was better to take the photos of Swallow Cave then head back to the other side of the cave using rope to cross the river again. The trek back is so nice with not climbing and great view. Crossing over shallow stream, walking through banana forest and spending sometime for hot green tea in Doong Village. All of that little things made a memorable tour. Due to bad weather, the expedition might not succeed as planned but everyone was all happy with what they experienced. Son Doong - We will come back soon.